One of my favorite things to do at the end of the week when the refrigerator is looking bare is to get out The Food Bible and see what combination of ingredients pair well together based on what I have on hand to make a tasty and (sometimes) unique meal. The ingredients in this salad are what I had available to work with and I was thoroughly pleased with the delicious outcome. 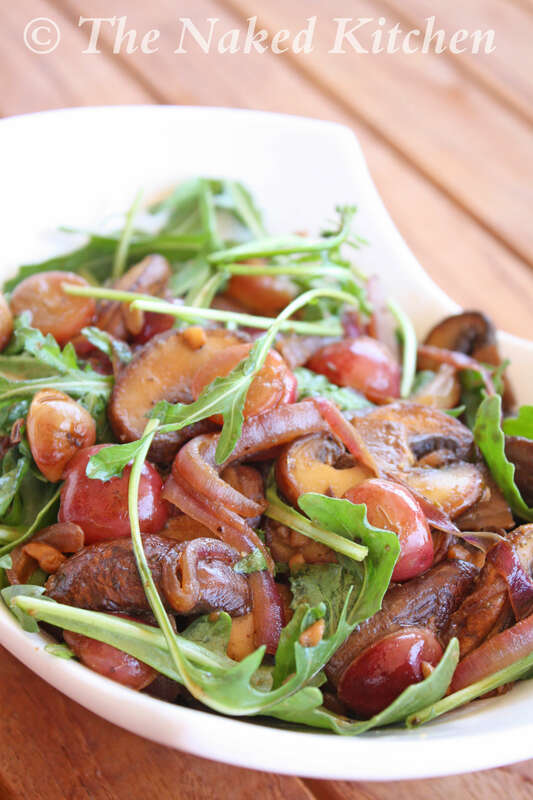 Earthy mushrooms combined with sweet grapes and pungent arugula glistening in a warm white wine dressing. Who knew such a combination would be so good? Heat a large skillet over medium high heat and add the oil. Add the mushrooms, onion, garlic, salt and pepper and sauté 6-7 minutes or until the mushrooms are tender and beginning to brown. Add the grapes and rosemary and sauté another 1-2 minutes. Carefully add the wine and simmer 3-4 minutes before adding enough nutritional yeast to slightly thicken the liquid. Place the arugula or spinach in a large serving bowl and pour the vegetables and dressing over the top. Toss to combine so that the warm dressing lightly wilts the greens. Serve immediately. Great served with big chunks of warm crusty bread. Makes 4 servings as a side dish or 2 as a light meal. This salad is best served right away.